Wizard Times Tables offers a 60-second test for each of the multipliers. Designing a fresh and unique approach for a classic problem can be a real challenge. This is especially true when it comes to designing a math app to drill one particular skill, such as multiplication. Many teachers and parents would come up with tests for basic multiplication facts and/or a times table. My app pick for today is designed to offer additional approaches for our kids to practice their multiplication skills. Called Wizard Times Tables, the app includes a couple of new approaches in addition to the standards mentioned above. Wizard Times Tables allows you to learn multiplication facts involving numbers from 1 to 12. The app is organized to make it easy to learn one multiplier at a time. It also includes some facts that can help you understand the nature of the multiplier a bit better. For example, when you learn about the x1 multiplier, the app will tell you that regardless how big or small the number is, it will stay the same. When you learn about the x2 multiplier, you will also learn about even numbers because the result is always an even number. This is also true for the other even multipliers, such as x4, x6, and x8. Other facts that you can find include how x5 multiplier will yield a number that ends in either 0 or 5, and how x10 multiplier will append a 0 to the end of the original number. Once you’re comfortable with the multiplication facts, you can try the practice mode. It will ask you to guess the multiplication result for each of the multiplication combination. Simply tap on the question mark to verify whether your guess is correct. The app also includes a 60-second test where you will be asked to fill in the results of each multiplication combination within a specific multiplier. But, the combination will be shown in a random order. For example, if you challenge yourself on an x3 multiplier, the app may show 4x3 and 11x3 before 1x3. 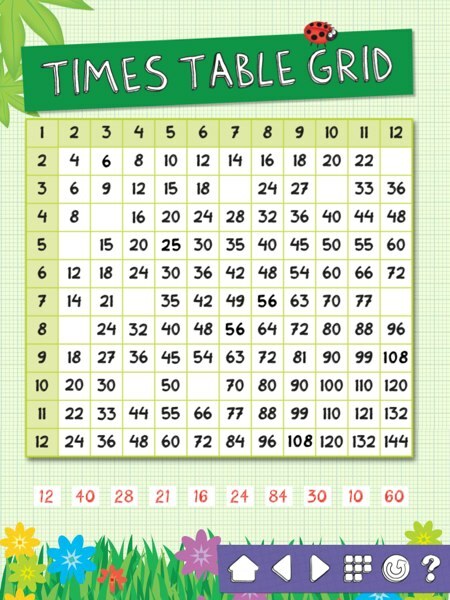 Fill in the empty cells in the times table with matching numbers below the table. Wizard Times Table is suitable for kids ages 8+ who still need to practice their multiplication skills. The app also offers additional approaches such as the Times Table Grid, Whiz Bang’s Magic Cauldron, and Quick Brain Teasers. In the first challenge, you’re asked to complete a 12x12 multiplication table by matching the empty cells with the numbers below the table. In the Magic Cauldron challenge, you get to learn about square numbers, such as 1, 4, 9, 16, and 144. It’s a simple game where you need to match the numbered bubbles with the multiplication question. Wizard Times Tables offers 12 sets of math word problems to help kids truly understand the multiplication concepts. I really appreciate the developers’ decision to include the Quick Brain Teasers. Apps that use math word problems are quite hard to find. Wizard Times Table includes 12 sets of word problems — one for each multiplier. I hope more developers would consider designing more apps that creatively use math word problems to challenge our kids. The app also allows you to record your own voice for each section of the learning mode. Some kids may prefer to listen to their parents explaining what they need to focus on. Once you have completed all the activities, you can unlock a shooting game. It also uses multiplication concepts to calculate the score. Wizard Times Tables is a math drill app for kids ages 8+ who still need to practice their multiplication skills. In addition to the standard multiplication facts and times table approaches, the app offers quick brain teasers consisting math word problems and introduces square numbers in a fun way. Make sure you finish all the activities, because a really fun shooting game awaits you.